Last rites of Mrs. Vincent. The body of Mrs. Cora Pearl Vincent, 55, who succumbed June 21 at the residence of her son, Dr. Ubert Conrad Vincent, 251 West 138th street was buried Friday beside that of her husband in the family plot at Woodlawn Cemetery. Three pastors officiated at the funeral services the same afternoon at Abyssinian Baptist Church. They were the Rev. A. Clayton Powell, Jr., assistant pastor of the church; the Rev. J.W. Brown of Mother Zion and the Rev. Richard M. Bolden of the First Emanuel Church. Arrangements for the funeral were in the hands of the Turner Undertaking and Embalming Company, 107 West 136 street, and the pallbearers were Drs. Paul Collins, Ira McCowan, Chester Chinn, J.W. Saunders, Charles A. Petioni, William Carter, Jesse Cesneres and Police Sergant Samuel Jesse Battles. Mrs. Vincent, whose husband, Dr. Andrew B. Vincent, was on the faculty of Shaw University for fifteen years, was born at Wilson, N.C., in 1873. She resided at Raleigh, N.C., until arrival in New York thirteen years ago. She was the mother of fourteen children, six of whom survive her. Besides Dr. Vincent they are Ruth, Pearl, Albert, Berniece and Mrs. Reba Ragsdale, the latter of the Dunbar apartments. Ruth, who lives in Chicago, came East for the funeral of her mother. The other children reside at 1849 Seventh avenue, where Mrs. Vincent made her home. — New York Amsterdam News, 29 June 1932. 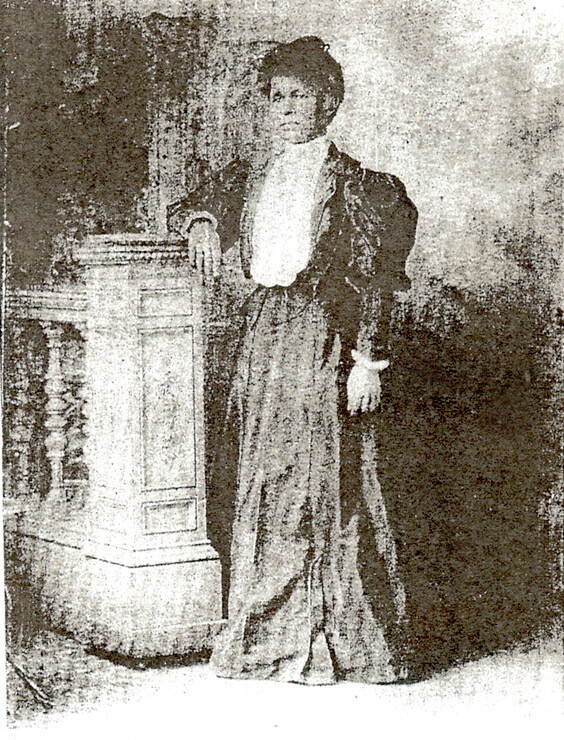 Cora P. Exum, 19, married A.B. Vincent, 27, on June 26, 1884, at the Globe House in Goldsboro, Wayne County. Photograph courtesy of user kriswms, http://www.ancestry.com. New York Age, 9 September 1922. The Battle sisters, teacher Georgia Burke and nurse Henrietta Colvert were neighbors as well as travel companions. 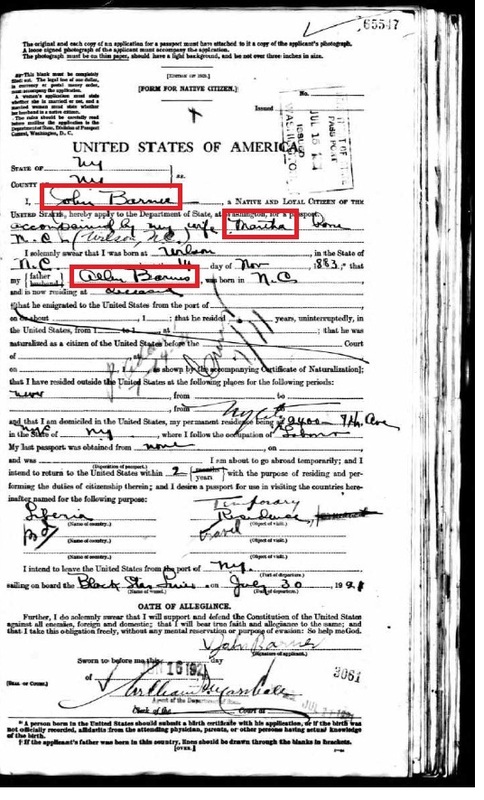 In the 1920 census of the Town of Wilson, Wilson County: at 330 South Spring Street, Henrietta Colvert is listed as a boarder in the household of widow Nannie Best, 61, and her extended family Frank, 30, Aaron, 21, Estelle, 19, and Harper Best, 65. Next door, at 332: widow Ella Battle, 52, and her children Grace [Glace], 27, teacher Roberta, 29, tobacco worker John, 25, and Olga Battle, 11, shared their home with boarders Georgia Burks, 25, a Georgia-born teacher, and chauffeur Theodore Speight, 17; and roomers William Phillips, 35, a dentist, and his wife Jewel, 23. In 1928, while taking a summer course at Columbia, she sang a few songs while attending a rehearsal for “Blackbirds of 1928.” Hired for the choir, she took a year’s leave of absence from teaching. She never returned. 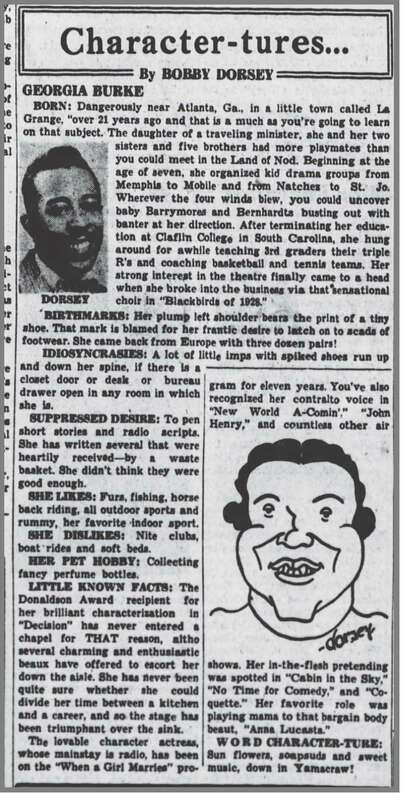 The Afro-American, 6 May 1944. New York Age, 26 March 1949. 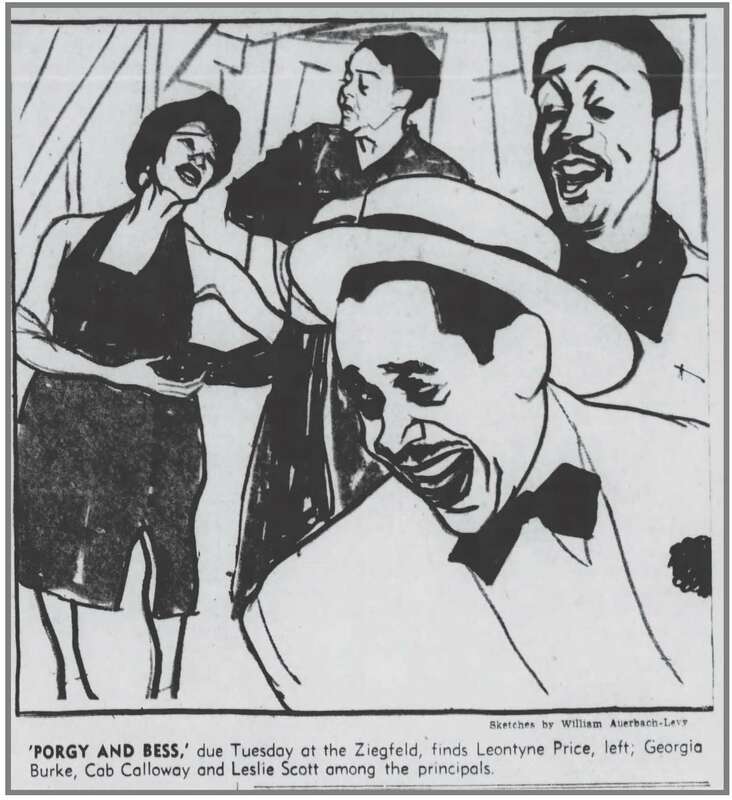 Brooklyn Daily Eagle, 8 March 1953. Georgia Burke, an actress who played character roles on Broadway from the 1920’s until her retirement in the 1960’s, died in the De Witt Nursing Home in Manhattan last Thursday. According to the records of the Actors Fund of America, she was 107 years old. Miss Burke appeared on Broadway in “The Grass Harp,” “The Wisteria Trees,” “No Time for Comedy,” “Mamba’s Daughters,” “They Shall Not Die,” “Anna Lucasta,” “Porgy and Bess,” “Cabin in the Sky,” “Mandingo” and “Decision,” for which she won the Donaldson Award in 1944. 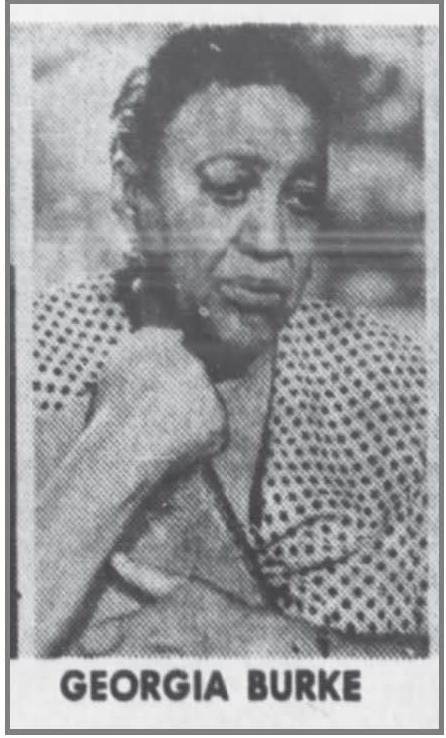 Born on Feb. 27, 1878, in La Grange, Ga., Miss Burke studied at Claflin University in Orangeburg, S. C., and taught fourth grade for six years. In 1929, she came to New York to take a summer course at Columbia University. At the time a black choir was being assembled for ”Blackbirds” on Broadway. A friend persuaded her to audition. She sang ”St. Louis Blues” and was hired on the spot and she left teaching to pursue an acting career. In addition, Miss Burke appeared on radio and television serials. For five years before and during World War II, she played the role of a nurse in ”When a Girl Marries.” There are no known survivors. A service, sponsored by the Actors Fund, will be held at noon tomorrow at the Walter B. Cooke Funeral Home, 1504 Third Avenue. — New York Times, 4 December 1985. Georgia Burke in “Anna Lucasta,” New York Age, 28 February 1959. 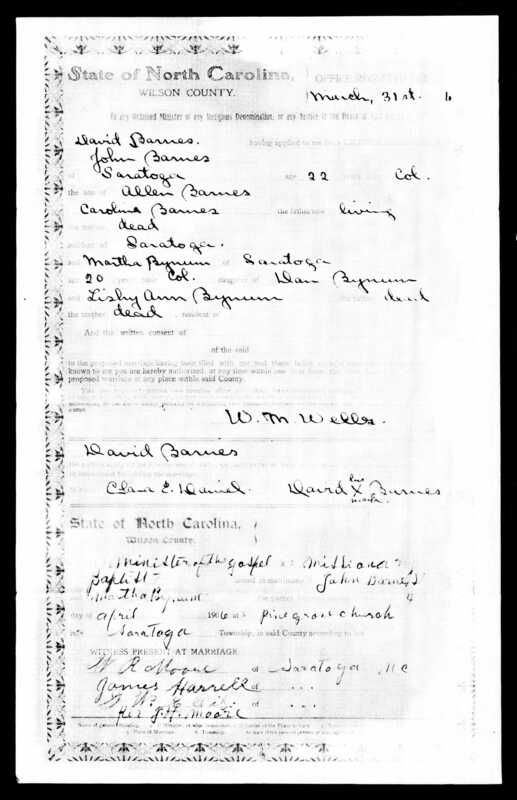 The passport application of John Barnes of New York, New York, born in Wilson, North Carolina, seeking to travel with his wife Martha to travel to Liberia on the Black Star Line. Here’s John in the 1900 census of Saratoga, Wilson County, with Allen and Calliann Barnes, and younger siblings Mary L., Dilla, Corinna, Willie and Bennie Barnes. “Calliann” may have been his stepmother, as Wilson County marriage records show that Allen Barnes, 22, married Caroline Best, 20, on 19 March 1885, when John was a little more than a year old. The handwritten notes affixed to the center and top of the right-hand page of John’s application read: (1) This man intends to travel on a boat owned by Garvey. Probably is a member of Garvey U.N.I.A. He is a laborer and wishes to go to a country where there are 2 million natives with nothing to do. This Division hopes psp’t will be refused. J.W. (2) I should be glad to refuse this man a passport but I do not see how we can do it. WRC[illegible] (3) I concur with above. Nothing tanglible against him. P. Adams 7-14-21 (4) Mrs B[illegible] Please issue. We have nothing personally against this man. He is a laborer and probably too ignorant to cause any trouble. P. Adams, 7-14-21. 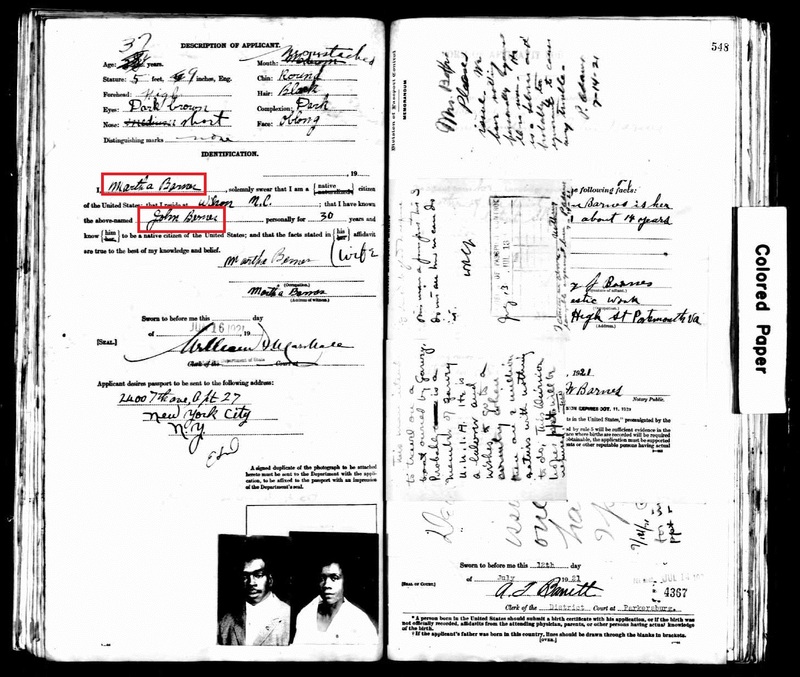 Passport Applications, January 2, 1906 – March 31, 1925, Roll # 1690, Volume # Roll 1690 – Certificates: 65250-65625, 14 Jul 1921-15 Jul 1921, National Archives and Records Administration.